Perfect Dresses for Pregnant Bridesmaids at NYB&Co. 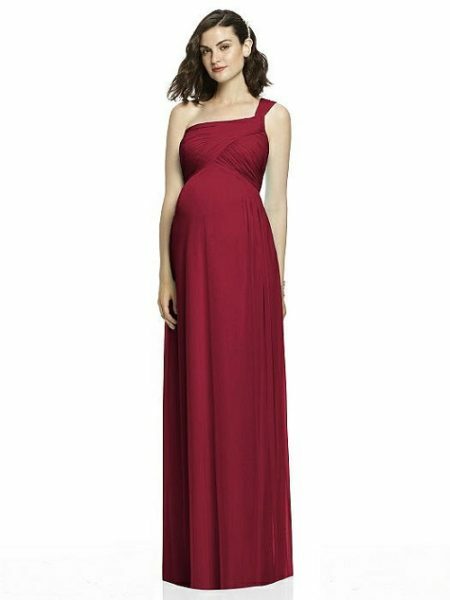 After Six Maternity Bridesmaid Gown, style M424: The Dessy Group offers a supportive and stylish bridesmaid option for your pregnant friend. The elegantly pleated bodice is as eye-catching as it is comfortable and flexible. A central back zipper and shirred skirt offers free-flowing flattery. The notched detailing along the neckline completes this definitive bridesmaid gown. Available in a huge variety of colors. Available sizes: 00-30W and 00-30W extra length. Dessy Collection, Maternity Bridesmaid Dress M430: This enticing strapless features a sweetheart neckline and shirred detailing. Full length and flattering, this dress does come with optional spaghetti straps for superior fit, comfort and support options. Available colors: Soho Metallic (shown above), black, rose gold or silver crush. Available sizes: 00-30W and 30W extra length. Your Measurements: Usually when bridesmaid dress shopping, your Personal Shopper will take your bust, waist, and hip measurements. However, if you are currently pregnant or plan to be, a waist measurement is next to useless. Your Personal Shopper will only take your bust and hip measurements, and will probably add on a few inches for future growth. Alfred Sung, style M427: This chiffon full length bridesmaid dress offers asymmetrical detailing and extra support. The draped bodice offer visual interest and flows in to a lightly shirred skirt for maximum style and comfort. Available in a wide selection of color options, shown in Burgundy above. Available sizes: 00-30W and 00-30W extra length. Some maternity designers create bridesmaid dresses for pregnant women, but they may not exactly match the other gowns in mind. Ask the bridal store if alterations can be made to a standard gown, including ordering a much larger size, adding elastic panels or another way to ensure the gown will stretch over a growing belly. Also, be considerate and choose a gown in an empire waist style so that it is flattering for the pregnant bridesmaid. Shoes: While pregnant, some women’s feet swell. Having strict restrictions on footwear can make a pregnant woman uncomfortable. Low heels or ballerina slippers can be comfortable and fashionable. The other members of the bridal party may also thank you for choosing a sensible shoe. With more than 15,000 square feet of modern luxury, over 20 dressing rooms and a full staff every day, New York Bride & Co. is the premier bridal salon in Syracuse and the surrounding area. We look forward to serving you soon.